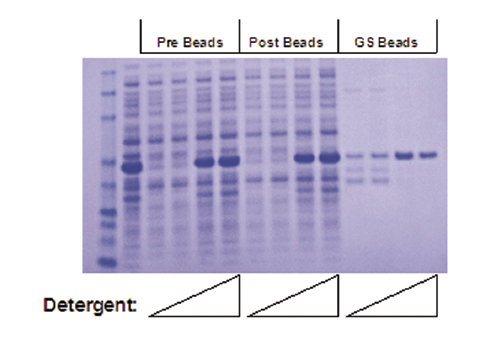 GST Protein Inclusion Body Solubilization | Cell Biolabs, Inc.
Recombinant proteins expressed in bacteria often form inclusion bodies, especially when they are expressed at high levels. The Rapid GST Inclusion Body Solubilization and Renaturation Kit is designed to retrieve expressed GST fusion proteins in soluble form after lysis and extraction procedures. Each kit contains sufficient reagents to solubilize and renature up to 5-10 liters of bacterial culture. Figure 2: Solubilization and Renaturation of GST-RTK fusion protein. GST-RTK expression was induced with 1 mM IPTG at 37ºC for 4 hours. 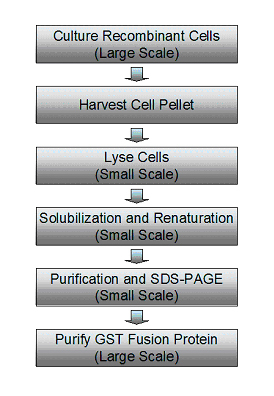 The cell pellet was lysed, and inclusion bodies were solubilized and renatured under different amounts of detergent solubilization solution according to the assay protocol. Lane 1: MW Standard; Lane 2: Whole E. coli lysate; Lanes 3, 7, 11: No detergent; Lanes 4, 8, 12: 32-fold dilution; Lanes 5, 9, 13: 8-fold dilution; Lanes 6, 10, 14: 2-fold dilution. Dixon, J. E. et al. (2016). Highly efficient delivery of functional cargoes by the synergistic effect of GAG binding motifs and cell-penetrating peptides. Proc Natl Acad Sci U S A. 113:E291-E299. Matsuoka, T. et al. (2014). Expression and characterization of honeybee, Apis mellifera, larva chymotrypsin-like protease. Apidologie. doi:10.1007/s13592-014-0313-2. Keller, D. et al. (2014). Mechanisms of HsSAS-6 assembly promoting centriole formation in human cells. J. Cell Biol. 204:697-712. Lalani, S. et al. (2013). MCTP2 is a Dosage-Sensitive Gene Required for Cardiac Outflow Tract Development. Hum. Mol. Genet. 10.1093/hmg/ddt283. Sabbah, M. et al. (2011). CCN5, A Novel Transcriptional Repressor of Transforming Growth Factor-ß Signaling Pathway. Mol. Cell. Biol. 10.1128/MCB.01316-10.